To give a flavour of the activities and experiences of the branch in the course of its various activities here is a log of some of the reports prepared for the Marine News, the monthly publication of the WSS. 2016 marks the 10th anniversary of the founding of the Cobh Branch of the World Ship Society. Those 10 years have been very successful, bringing a wide range of speakers to our meetings and presenting members to engage in visits to places of maritime importance. The Committee suggested that we mark this success with a special event. 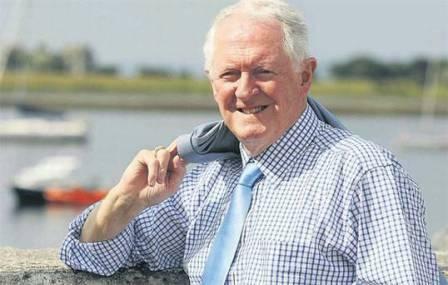 After much discussion a fundraising night for the Ballycotton Lifeboat station was agreed on. The plan evolved over months with meetings in Ballycotton with the key station pesonnel and finally a colourful and interesting programme was presented for our March 2016 meeting. Our Master of Ceremonies for the night was our friend and RTE Seascapes presented, Marcus Connaughton. Marcus oversaw an excellent programme of presentations by Noreen O'Sullivan, Cox'n Eolan Walsh, and Mech Peter O'Shea, supported by other crew members. The Ballycotton Lifeboat shop was also in attendance managed ably by Nuala Whelan. 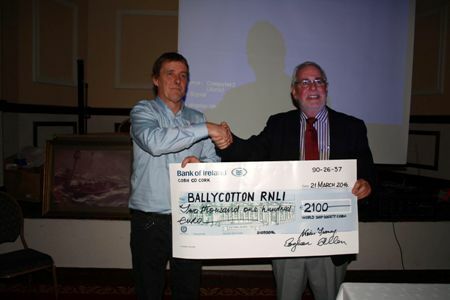 The branch Committee and members worked over many months to make a success of the night which raised the sum of 2100 Euro for the Lifeboat Service in Ballycotton. We feel that we celebrated our anniversary in style and thank all that supported, sponsored and attended the event. Branch member, Capt Brian Daly, presented a slide show to the February meeting of his visit to Antarctica. Brian's cruise through the South Atlantic and Antarctica visited Montevideo, the Falkland Islands, Grytviken and Elephant Island. The cruise followed the trail of the great Antarctic explorer Ernest Shackleton. Brian also had the opportunity to visit key historical sites on his journey. He presented an excellent evenings entertainment in his own inimitable style. As usual the presentation was followed by some lively discussion by our resident experts. In 1985 Cork marked the 800 anniversary of it's status as a chartered city. The year was marked by a wide range of events reflecting the history of the City and County. Our branch member , Oliver Hawes, that year organised a maritime exhibition depicting the maritime history including , the exhibition included a comprehensive display of models, memorabilia and art. Oliver recorded the exhibition on slides. At the branch Jan 2016 meeting Oliver presented his slide show. The evening was very successful with many contributions from members of their maritime experiences. The Cobh Branch of WSS held it annual dinner in the Commodore Hotel. The night as usual was well attended and the Christmas fare presented by the hotel surpassed expectations. Harry Spong, our after dinner speaker, flew in from Bristol for the event and regaled the members with a really entertaining description of life on the ocean wave, from the comfort of a cruise ship! Harry has been a friend of the branch for many a year now and has joined us on previous occasions. Hailing originally from Castletownbere, Harry was very much at home with us. This years Christmas raffle was again a popular event, especially as the tickets were free, and a wide variety of maritime related prizes were on offer. As usual the mainbrace was spliced after dinner in the comfort of the bar where the stories and yearns became more unbelievable as the night wore on. The Branch winter outing visited Portsmouth this November. 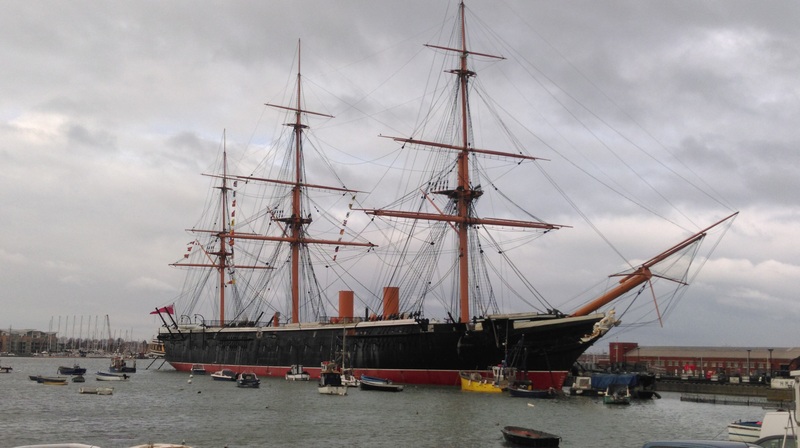 Within a working Naval Base, Portsmouth Historic Dockyard holds a collection of fantastic attractions. This visit had been anticipated for years. Portsmouth was particularly colourful as the Royal dockyard was preparing to host a Christmas market. The highlights were our visits to the HMS. VICTORY, MARY ROSE, WARRIOR, and the more recently added Dardanelles campaign gunship, the HMS. M33. Undoubtedly the highlight of the visit was the HMS WARRIOR, a beautiful ship, a one time coal hulk, destined for the breakers yard, lovingly restored. MV FUNCHAL of Portuscale Cruises, Portugal, is one of the last classic ocean liners still sailing today. To sail on FUNCHAL is a step back in time to the era of ocean travel which can’t be replicated by modern cruise ships. Therefore, last August’s cruise on FUNCHAL by the members of the Cobh Branch of the World Ship Society was an experience that will long be remembered. 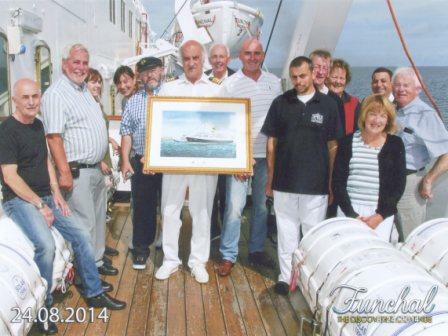 A visit to the ship by the branch members when it berthed at Cobh in May 2014 planted the seed for the cruise. The warm welcome aboard by Capt. Jose Valente and his Hotel Manager, Jose Oliveira, a tour of the ship and a magnificent lunch, all helped to root that seed. MV FUNCHAL was built at the Helsingor Shipyard (yard no.353) in Denmark in 1961. She was totally refurbished at Lisbon in 2013. She is 9,563 tons gross. Length 153m, beam 19m, draft 6m approx. MV FUNCHAL was built for service to Madeira and Canary Islands from Lisbon. Her maiden voyage was on 4th November 1961. She was also used as a Presidential Yacht on many occasions. President of the Republic, Americo Tomas accompanied the body of King Dom Pedro IV of Portugal & Emperor of Brazil when the FUNCHAL transported his body to Rio de Janeiro in 1972. On this symbolic voyage to mark the 150th anniversary of the independence of Brazil, there were no passengers onboard, only the official party from both countries. She was escorted across the South Atlantic by Portuguese and Brazilian warships. In 1974, the FUNCHAL became a cruise liner and visited many ports around the world until her last owners, Classic International Cruises, went into liquidation in 2010. The ship was subsequently laid up in Lisbon and nearly scrapped. This beautiful old ship was saved from the breakers yard by its new owner, Mr. Rui Alegre, Chairman and CEO of Portuscale Cruises, in March 2013. The enormous job of restoring FUNCHAL to her former glory began immediately. She was completely gutted and refitted in less than a year by the Vianadecon Shipyard in Lisbon. All of these facts and figures combined with a visit to the bridge, whetted our appetite to plan a cruise. The shipyard’s magnificent restoration work, in the public spaces and staterooms delighted everybody. It turned out that our favourite was Porto Bar. This elegant, intimate and comfortable bar amidships had the atmosphere of a private yacht. It is a delightful bar in which to relax with friends after dinner, while listening to the ship’s pianist and singers, and because of its size we struck up many interesting conversations with other passengers. We even witnessed a marriage proposal by one of the passengers during a nightly concert – and fortunately, the answer was yes, or to be more exact, in Portuguese, “Sim”! The Gama Lounge forward was a wonderful place to enjoy the panoramic views of the ocean on sea days or to just read to the motion of FUNCHAL as she steamed her way to the next port. The main restaurant “Lisboa” was one deck below amidships on Azores Deck. This tastefully decorated dining room has ocean-view picture windows on all sides. The food is excellent and the menu has something to satisfy every taste. The wine list includes top quality Portuguese wine from the owner’s vineyard at very reasonable prices. One of the many dining experiences was the Buffet night proudly prepared by the ship’s chefs and enjoyed by all onboard, once the cameras were put away. We were even entertained by the ship’s company one night! They were certainly a very contented crew and nothing was too much trouble. We even though of making the hotel manager, Jose Oliveira, an honorary Irish citizen! The Buffet restaurant overlooking the swimming pool on the after deck was the venue for breakfast or lunch. This was another delightful area in which to dine and take in the unfolding scenery of the ocean or river bank MV FUNCHAL’s outdoor and promenade teak decks enhanced the yacht -like feel that was so evident throughout this beautiful vessel. 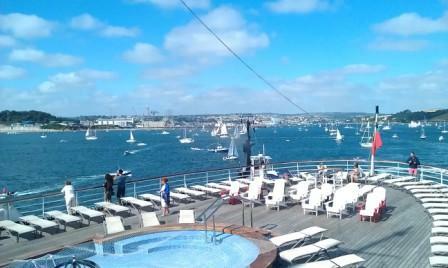 Our 12day cruise began at Falmouth and ended at Lisbon. Our first call after a day at sea was to Bilbao in Spain. A highlight during our day at sea was the morning spent on the bridge, with Captain Valente and some of his officers where we discussed a wide range of shipping related topics. One of our members on the cruise, a renowned Irish marine artist, Brian Cleare, had specially painted a picture of FUNCHAL entering Cork Harbour, with Roches Point in the background and the tug GERRY O’SULLIVAN in attendance. This unique, signed painting was presented to Capt Jose Valente. After Bilbao we had an overnight sail to Bordeaux, probably France’s premier wine region. The long passage, almost 100km up the Gironde Estuary was really spectacular. That night we cruised the short hop to La Rochelle where we had a really enjoyable day ashore. The next day was another one at sea, our destination Honfleur. Honfleur is one of those quaint “must go back to” places. Beautiful architecture, fantastic waterside cafes, it seemed that the only thing missing was the swashbuckling pirates from another era … maybe next time! Our next port of call was St.Mary’s in the Isles of Scilly, where we went ashore by tender, to experience this Atlantic oasis. 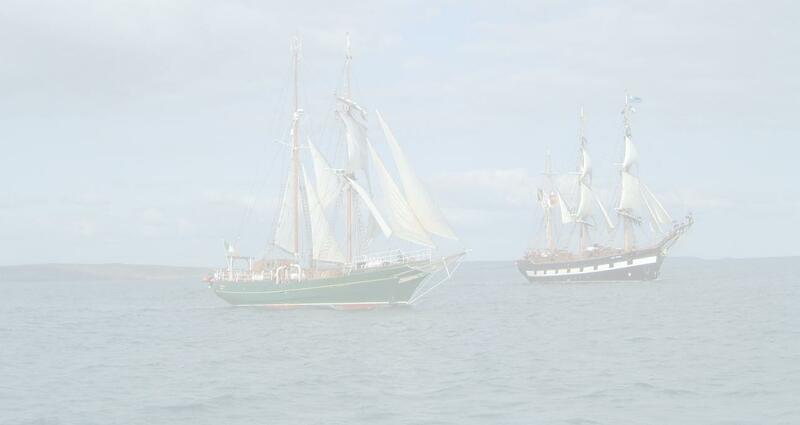 Our week ended with a return to Falmouth, and a quick turnaround, just in time to join the Tall Ships parade of sail as they set off on the next leg of their race. Our grandstand view of the Tall Ship fleet from the decks of FUNCHAL was yet another highlight for many on this cruise; our departure coincided with the parade of sail. Our next port of call was Lisbon, our final destination. The cruise down the Bay of Biscay for the second time was thrilling experience. The old lady gently rolled in a heavy swell as the sun shone down on her teak afterdeck that was continuously washed by water spilling from the swimming pool. Standing at her stern flagpole as she rolled in the swell one would think that you were at the tiller of a classic yacht. Not everyone could appreciate this feeling however, as they were too busy searching for the seasick pills! Let’s just say that one or two still had not found their sealegs! But the mood soon lifted as we sailed down the Portuguese coast in glorious sunshine on the way to Lisbon. As the FUNCHAL entered the port in the early evening sunlight, the wonders of Lisbon from the river Tagus unfolded, revealing The Belem Tower and the 25 de April Bridge (Golden Gate’s twin sister) and that splendid city built on seven hills. With a tinge of sadness, we disembarked from this unique ocean liner and its happy crew. However, everyone agreed that we will return again. FUNCHAL cruising is quite different, because along with the classic experience the passenger is cosseted and cared for to the highest standard. The facilities and service are par-excellence. To our readers we say, do not let this wonderful ship pass you by. The USS EMPIRE STATE visited Cobh in June 2014 as part of her European cruise. As the Branch has a special interest in classic shipping a second visit to the ship was requested, we had previously been aboard the Empire State during an earlier call to the port. Originally built for the United States Lines as the OREGON she later served with Moore McCormack Lines and finally went into US government service as a troop transport vessel for the Navy and a training ship for the merchant marine. The branch members were given a most detailed tour, visiting every nook and cranny on board, from mast head to bilge and from bow to stern. Our engineering gurus were especially excited to visit the engine room to see the steam turbines. We surprised a number of the trainees with information about the historical involvement of the US Navy in our port during WW I, so we felt that we gave something in return. We met with Captain Richard Smith and his officers for refreshments which we needed after hours tramping through the holds, education areas, engine spaces, bridge, accommodation and dining facilities. The visit to EMPIRE STATE very definitely got the thumbs up! 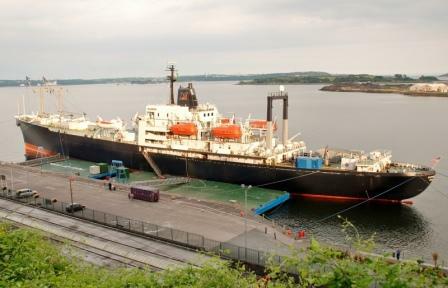 USS LEYTE GULF in Cobh. 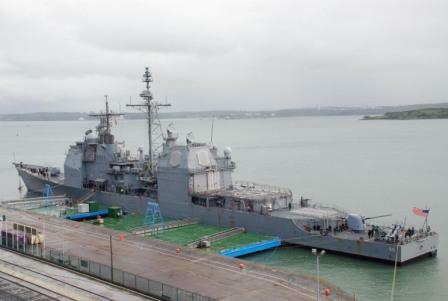 The USS LEYTE GULF, a Ticonderoga class guided missile cruiser was the target for the Cobh Branch WSS to visit when she berthed at the Deep Water Quay on the 12th of April. we had a most enjoyable visit, which included a detailed tour of the vessel and a brief on her recent operations. LEYTE GULF has recently completed a major refit and upgrade. Prior to that she was involved in anti-piracy operations off the coast of Somalia. The ship remained alongside for a week. 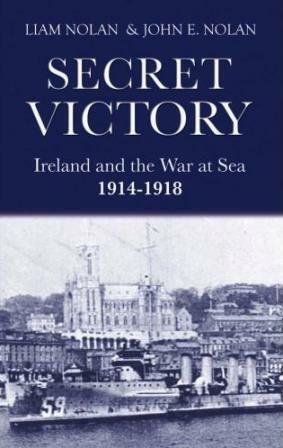 Distinguished Cobh person, broadcaster and writer Liam Nolan visited Cobh Branch to speak about his book "The Secret Victory" which he co-wrote with his brother John. Liam who previously worked with BBC, ITV and RTE is a voice well known in all Irish households. He engaged the branch in a tour through the port activities in the lead up to WW1, the appointment of Admiral Lewis Bayly RN as Commander in Chief, Coast of Ireland, and finally the arrival and operations activities of the US destroyer squadron based in Cobh. The audience for Liam's presentation were enraptured by the detail, questions and discussion went on into the late hours. The following day Liam was given a Civic Reception by the town council which was hosted by the Mayor Cllr. Sinead Sheppard. Then we toured the new Titanic Exhibition Centre and the recently inaugurated Titanic Park. Liam regaled us with stories of his childhood in Cobh and the characters of this seaside town who now have all sailed "over the horizon". He was accosted by many friends and acquaintances during his walkabout. The fading light eventually brought proceedings to a halt. Very definitely an outstanding event - Thank you Liam. 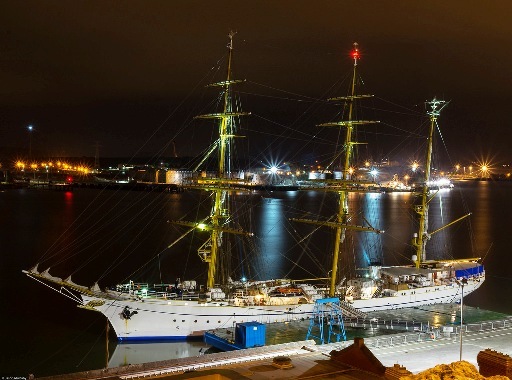 Captain Helge Risch and his crew welcomed a visit from the branch to the GORCH FOCK during her visit to Cobh on the 13th of March. GORCH FOCK is a sail training tall ship in the German Navy. Built in 1958 she is the sister ship of the original GORCH FOCK which was built in 1933. The ship is in pristine condition throughout and is a credit to her crew. Captain Risch explained in detail the role and function of the ship in the German Navy, the benefits of this traditional sail training to cadets and other trainees. As we toured this wonderful ship we had cause to seriously regret that since the sinking of Asgard II in 2008, Ireland now has no sail training vessel and the traditions of the sea, character and team building are no longer transferred to our youth through sail training programmes on tall ships (ASGARD II is the two masted brigantine shown on the background image of this website's pages). The visit also presented a great opportunity to discuss areas of common interest in our maritime histories especially the WWII story of the neutral Irish Ship KERLOGUE which was attacked by both sides and rescued people from both sides of that conflict. In December 1943 KERLOGUE, under command of Captain Thomas Donohue, rescued 168 shipwrecked German sailors from the Narvik class destroyer Z27 and landed them in Cobh a very short distance from where the GORCH FOCK was berthed. We presented the ship with detailed reports of the KERLOGUE story. Presentations were exchanged with the Captain at the end of an excellent visit and we look forward to the return of this fine ship to our harbour.